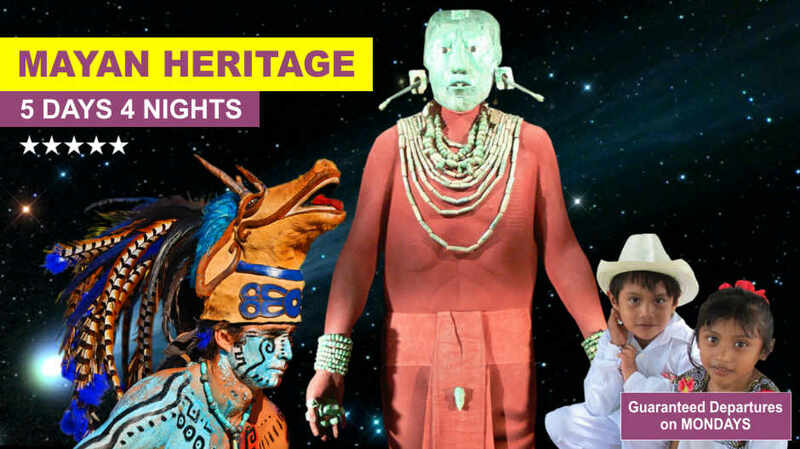 Are you interested in exploring the Maya World in Mexico? 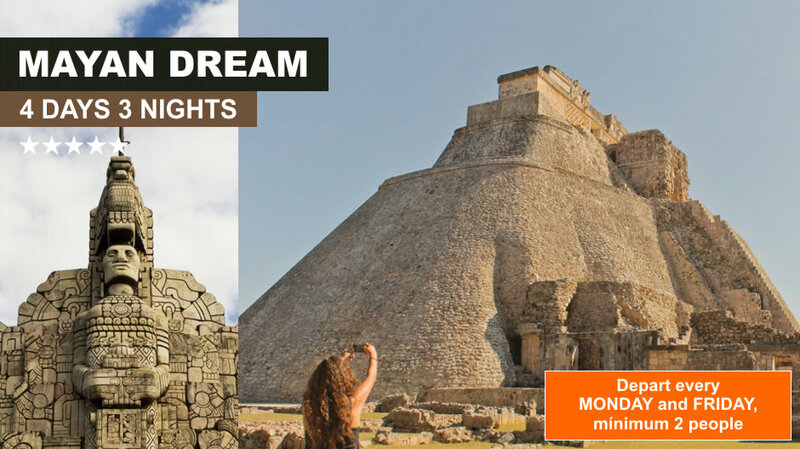 The Mini Yucatan Package, a two days one-night trip is your best choice! 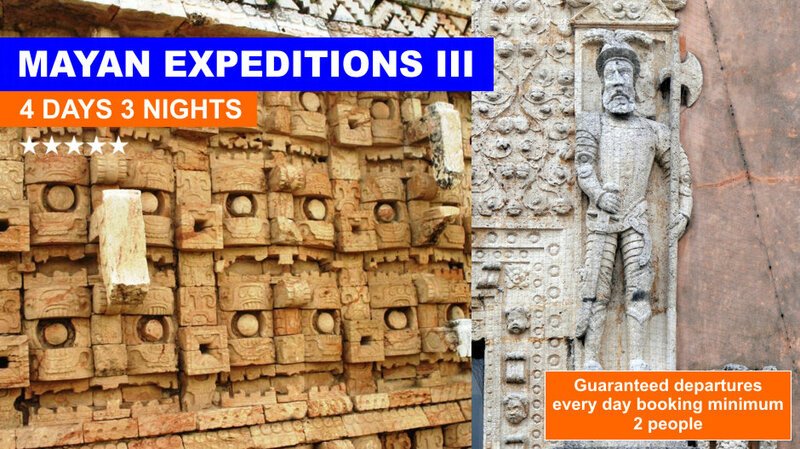 Specially designed for those people interested in knowing more about the people who live in the Southeast of Mexico of Mexico, it is a guided short tour that takes you back in time to discover a great civilization: The Maya. We will visit the city of Merida, Uxmal, Izamal and Chichen Itza in the Yucatan Peninsula. ONE HOTEL NIGHT (double basis). Beverages during the two meals. Breakfast on the second day. 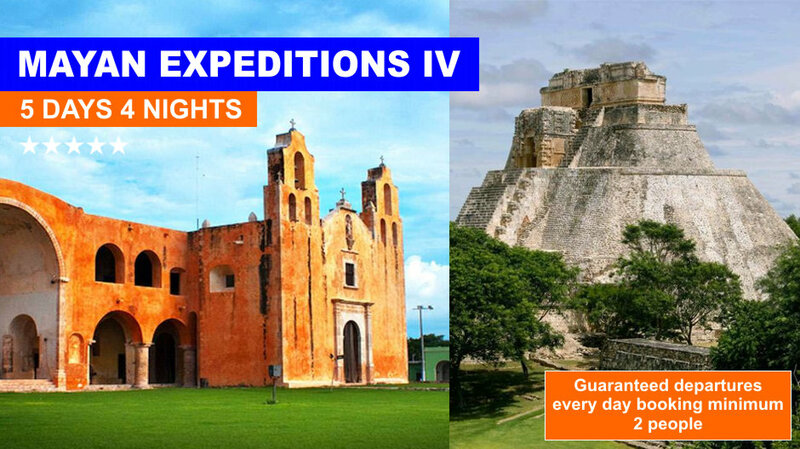 07:15 a.m. Departure from your Hotel Lobby to UXMAL via highway, once we arrived at the site, we will have the guided tour by our professional bilingual tour guide. 13:30 p.m. Lunch in a nearby restaurant. 14:30 p.m. Return to MERIDA for a time to tour La Plaza Grande (Main town square) and then check in at the hotel. Free afternoon. 07:15 a.m. Breakfast (Not incluided). 08:30 a.m. 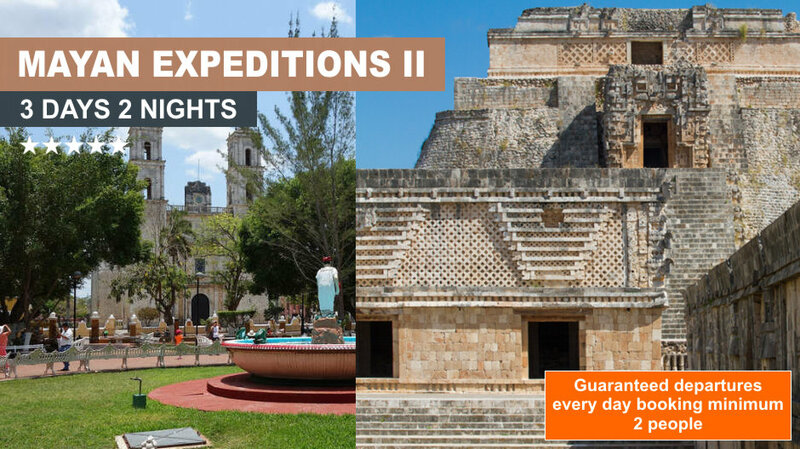 Check out and city tour at Merida before we start our way to: IZAMAL; visit the Convent of San Antonio de Padua from the 16th. Century. CHICHEN ITZA; visit the Castillo, the Observatory, the Ball Court. 18:30 p.m. Return to Cancun or Playa del Carmen. One of the best tours in Mexico. In this peninsular tour you can experience the one of the most historic cities of Mï¿½xico, a magic town and the most important Mayan pyramid. Known as the "White City", Merida is a beautiful XVI century colonial town, in which we will have the opportunity to know the main plaza or town square, the house of the Spanish conqueror Don Francisco de Montejo. Izamal is another colonial town where time doesn't seem to have passed, beautifully painted in a pale yellow color, most of the houses and main buildings are just a wonderful place to visit, the convent of San Antonio de Padua was built on top of an ancient Mayan platform and that makes the atrium of the convent to be the world's second largest after Saint Peter's basilica in the Vatican. Uxmal is an ancient Mayan city of the classic period, located south of Merida, built with a constructive style known as Puuc or "mosaic" is one of the most beautiful cities ever built by the Maya, a truly must see. Chichen Itza, one of the new seven wonders of the world is a great place to visit, a place where Mayan engineering, architecture, mathematics and astronomy were all combined to create this incredible Mayan city, we will visit the most important buildings in this beautiful Mayan ancient city. Private tour 6 pax and on can depart any day. The room is for two people, in case of individual booking applies an extra charge. The Hotel for this tour is three-star hotel in the center of Merida, Yucatan.